Olympic Stadium CGI. London 2012. Striker Alex Danson helped Team GB’s women’s hockey team beat New Zealand 3-1 in the third and fourth place play-off at the Riverbank Arena. 45 minutes in, Alex’s dart into the circle secured a penalty corner. Captain Kate Walsh took it and drove the ball at the goal. Danson shot it past the goal minder to secure the first goal of the match and her fifth goal of the tournament. It was the first Olympic medal won by a British women’s hockey team for 20 years. 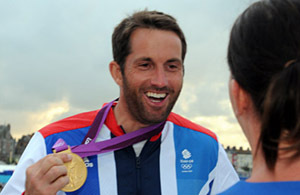 Ben Ainslie has won his fourth straight gold medal to become the most decorated Olympic sailor in history. He came ninth in a close Finn medal race in Weymouth to beat rival Jonas Hogh-Christensen. To celebrate after crossing the line, Ainslie set off a flare and held up a Union Jack flag as the huge crowds cheered his success. At the Closing Ceremony, Ben had the honour of holding the Union Jack flag on behalf of Team GB. The post box in Lymington was painted gold – but not by Royal Mail. Although the restaurant owner that painted the post box was arrested, royal Mail changed their mind and allowed the post box to stay gold at the request of Ben. A special edition stamp featuring Ben during his medal winning race was released by Royal Mail. Defending Olympic champions Iain Percy and Andrew Simpson won silver in the Star class in Weymouth. They had sailed exceptionally and entered the final race with an eight-point lead over Brazil’s Robert Scheidt and Bruno Prada. Sweden however, were the team that finally denied them a gold medal. They needed to finish sixth or higher to beat the Swedes but they suffered on the final downwind and moved from fourth place to finish in seventh. Hampshire track cyclist Dani King has helped win Team GB’s 11th gold medal at the London Velodrome. Double world champions Dani King, Laura Trott and Joanna Rowsell won the women’s team pusuit in 3mins 14.051secs, setting a new world record. The team also set new world records in their previous 5 rides. “I don’t think we expected to break the world record in every single ride that we did,” she said. Born in Southampton and schooled in Hamble-le-Rice, King has done Hampshire proud. Hampshire rowers James Foad (Southampton) and Alex Partridge (Alton) won bronze medals for Team GB as part of the men’s eight team at Eton Dorney. The British crew briefly led mid-way through the race, but Germany and defending Olympic champions Canada came back at them over the last 500m in an exciting race. Pete Waterfield finished in fourth place with diving partner Tom Daley in the 10m synchro. Helena Lucas from Southampton has won a historic gold medal in the 2.4mR class paralympic sailing. This is the first time that Britain has ever won a gold medal in paralympic sailing and the achievement was even more sweet because Lucas was the only woman in the fleet. The last day of sailing was cancelled because of a lack of wind which meant that the standings from race 10 became final. Helena dominated the 16-boat fleet all week and proved that she deserved her gold medal – an ambition she has held since she was 13. “It hasn’t quite sunk in yet” she said. Winchester Cathedral Outer Close played host to a giant outdoor screen showing live coverage of The Games. It was one of only 16 live sites in the country. The Olympic Torch spent more time in Hampshire than any other county. It had two overnight stopovers which were marked with evening celebrations. The Flame first entered Hampshire on 11th July at Basingstoke. It then travelled to Kings Worthy, Winchester and Andover. On 14th July, it travelled to Lyndhurst, Brockenhurst, Lymington and Totland. It then crossed to the Isle of Wight, returning to Hampshire again at Southampton where it staedy overnight. Evening celebrations took place in Mayflower Park. On 15th July, the Flame left Southampton, bound for Fareham, Bridgemary, Gosport and Portsmouth (where it will stayed overnight). Evening celebrations took place in Portsmouth at Southsea Common. It left the county on 16th July.